I received a press release the other day from Resorts Casino Hotel in Atlantic City and I thought that as someone who loves to gamble…and who loves horse racing… it was kinda interesting. The Casino was announcing the debut of Triple Towers Virtual Horse Racing. Now available exclusively in New Jersey at Resorts, this horse racing themed game provides slot players a simple way to enjoy the horse race betting experience in a group-play atmosphere. Created for IGT’s M-P Series® hardware, players place bets on 23-inch monitors at individual player stations and a 57-inch large-format LCD central display. Dynamic camera angles, 3-D technology, realistic sounds effects and race commentary bring the experience of the racetrack to life. 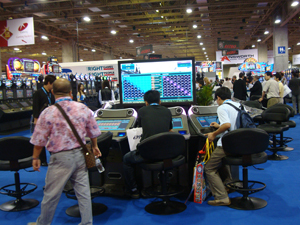 The individual player stations feature touch-sensitive screens that allow players to make wagers and access onscreen help before, during and after each race. The central display shows horse history and handicap information before each race. Much like wagering at a live racetrack, players place traditional bets – Win, Place or Show – as well as Exacta and Quinella. Players can also make quick pick bets, random bets based on the player’s selected wager value and bet type. Bets are made in $1 denominations with a minimum of $3 and a maximum of $50 in total bets. A jackpot bonus feature randomly selects a race result and awards players the displayed amount if the race finishes in that exact order. The jackpot amount varies based on the number of horses that finish in order and the player’s total wager amount. OK… it’s not real. And I don’t get (no matter what they say) the real thrill of being at a track. I’ll be in Atlantic City in a few weeks and hope to check it out for you. Meanwhile, if anyone reading this has been to Resorts lately and wants to report on it, just email me.